Staphylococcus aureus is a contagious, opportunistic pathogen that causes clinical or subclinical mastitis in dairy cattle. The genetic background and antimicrobial resistance of isolates from Ethiopian dairy farms has not been studied. Therefore, the aim of this study was to characterize S. aureus from Ethiopian hand milked dairy cows, by spa, MLST and virulence factor typing, and by assessment of antimicrobial susceptibility. A total of 79 S. aureus isolates from intramammary infections was studied. A PCR was used to detect lukM-lukF’ and pvl genes encoding the bovine and human associated bi-component leukocidins, and the toxic shock syndrome toxin gene-1 (tst). Antimicrobial susceptibility was determined using the broth microdilution method. Twenty different spa types were identified, most isolates were t042 (58%), and the closely related t15786 (11%). The proportion of isolates positive for lukM-lukF’, tst and pvl was low at 0.04, 0.10 and 0.09 respectively, with lukM-lukF’ often co-occurring with tst, but not with pvl. Methicillin-resistance was not found, but resistance to penicillin/ampicillin (86%) and tetracycline (54%) was very common. 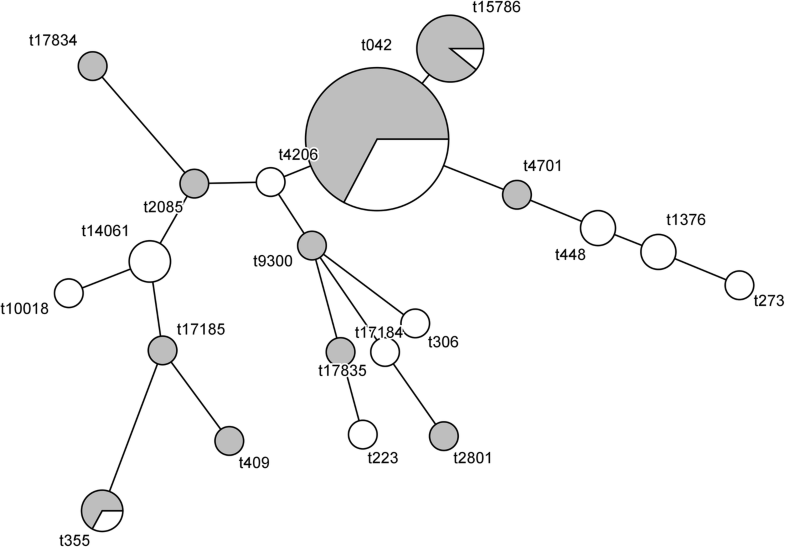 We found a high degree of relatedness among bovine S. aureus isolates in North-Western Ethiopia, suggesting contagious within and between farm transmission of strains that are often resistant to commonly used antimicrobials. This highlights the need for effective preventive measures that aim at limiting transmission of bacteria rather than using antimicrobials to control S. aureus mastitis in Ethiopia. Staphylococcus aureus is a contagious pathogen that causes mastitis in dairy cattle [1, 2], and is an opportunistic pathogen in humans and many other animal species [3–5]. Also in Ethiopia, S. aureus is frequently isolated from cows with mastitis [6–8], and from milk or milk products . In dairy cows, S. aureus can be isolated from milk as well as from different other body sites [10, 11]. Transmission of S. aureus intramammary infections (IMI) is believed to mainly occur during the milking process , but this has been poorly researched in situations where hand milking is common, as is the case in Ethiopia. Additionally, hand milking may introduce possibilities for transmission between farmers and their cattle. Typing of S. aureus isolates may give insight in their likely origin, because MLST and spa-types and virulence factors often are host-associated [13, 14]. Genetic similarity of isolates within and between farms suggests contagious transmission in the spread of bacteria  whereas a greater variety of genotypes within herds or regions is more suggestive of environmental pathogens . Genotyping does not only give information on modes of transmission, but can also be used to identify virulence factors of the bacteria. Depending on their clonal lineage, S. aureus may carry the phage-encoded leukocidin genes lukM-lukF’ [16–18]. LukMF’ is a potent toxin specifically killing bovine neutrophils  and likely to contribute to the clinical severity of mastitis . The proportion of bovine S. aureus isolates encoding this toxin varies largely between countries , but to our knowledge this has not been estimated in isolates of IMI from African cattle. Because the use of antimicrobial drugs, both in humans and animals, is poorly controlled, multidrug resistant S. aureus are frequently isolated from animals [6, 7] and humans in Ethiopia [22–24]. In S. aureus isolated from humans, there is a trend of increasing antimicrobial resistance (AMR) . Describing AMR patterns in both humans and animals may contribute to the knowledge on the importance of the issue in Ethiopia and to a more prudent and effective antimicrobial use. In smallholder dairy farming, effective control of S. aureus mastitis is important, because mastitis can have a substantial effect on family income. Since only a limited number of studies characterized bovine S. aureus isolated from Ethiopia [9, 26], the aim of the present study was to characterize S. aureus isolates from milk samples from hand milked dairy cows in North-Western Ethiopia by spa and MLST typing, virulence genes and antimicrobial susceptibility. A total of 135 phenotypically isolated S. aureus were available from an earlier cross-sectional study conducted from October 2014 to December 2016 in 167 urban and peri-urban smallholder dairy farms in the regions Gondar and Bahir Dar, in the North-West of Ethiopia . Nine isolates were lost. Forty seven isolates were excluded from the study because data of isolates were lost (11), data mismatched (8), and genotypically non S. aureus (28). Seventy nine S. aureus isolates that had complete data records were available (two from clinical mastitis (CM), 53 from California mastitis test (CMT) positive and 24 from CMT negative quarters) for spa and MLST typing, virulence genes detection and antimicrobial susceptibility testing. The 79 isolates were derived from 60 dairy cows in 42 dairy herds and were kept in glycerol stocks at − 80 °C until further study. Single colonies from an overnight culture grown on blood agar plates were suspended in 1 mL of distilled water, homogenized using Vortex and centrifuged for 1 min at 13,000 rpm. Supernatant was removed and the bacteria were re-suspended in 200 μL of distilled water, boiled for 10 min at 100 °C and centrifuged at 13,000 rpm for 1 min. The extracted DNA was diluted 1:10 in distilled water and stored at − 20 °C until further analysis. Polymerase chain reactions were performed on 10 μL of the DNA of all 79 isolates to confirm the isolates were S. aureus (femA), to test for presence of the mecA gene, encoding resistance to methicillin, and to amplify the polymorphic X region of the surface protein A (spa) gene. We also used PCR to detect lukM-lukF’ and pvl genes encoding the bovine and human associated bi-component leukocidins, respectively, and the toxic shock syndrome toxin gene-1 (tst). Primers and protocols are summarized in Table 1. Amplifications were carried out in final volumes of 25 μL using a T100™ Thermal Cycler (Bio-Rad, USA). The presence of appropriate amplicon sizes was examined by electrophoresis of 10 μL PCR product on 1.5% agarose at 100 V for 40 min. PCR products were visualized with a molecular Imager Gel Doc XR+ Imaging system (Bio-Rad, USA). The product of the spa gene PCR was cleaned up from unbound primers and nucleotides using ExoSAP-IT PCR Cleanup Reagent (Affymetrix, USA) according to manufacturer’s instructions and was submitted for Sanger sequencing (Baseclear BV, The Netherlands). The spa types were assigned using BioNumerics version 7 (Applied Maths, Belgium), using the spa-typing plugin and Ridom SpaServer (http://www.spaserver.ridom.de). A minimum spanning tree (MST) was constructed in BioNumerics using the spa clustering method of the spa typing plugin. Repeat successions were aligned using a gap creation cost of 100%, gap extension cost of 50%, duplicate creation and duplicate extension costs of both 25% and a maximum duplication number of 3 repeats. The MST was built using the MST cluster method and the default cost matrix with a 1% grouping distance bin. To save costs, multilocus sequence typing (MLST) as described by Enright et al. was performed on a selection of ten of the 79 isolates: on six t042 isolates, and on 4 isolates of spa types t273, t17184, t488 and t409. These ten isolates were selected aiming to optimally represent the various spa types and the two regions (Gondar and Bahir Dar). Sequence types were assigned using BioNumerics. Antimicrobial susceptibility testing was performed by determining minimum inhibitory concentrations (MICs) using the MICRONAUT system (Merlin Diagnostika, Germany) in customized prepared 96-wells microtiter plates containing dilution series of 17 antimicrobials. Inoculum preparation, broth composition and incubation conditions were performed as recommended by the manufacturer. Reading of the plates after incubation was done with a photometer (Skan, Merlin Diagnostika, Germany). Staphylococcus aureus ATCC 29213 was used as quality control strain. Clinical breakpoints were used according to the Clinical and Laboratory Standards Institute (CLSI) standards [28, 29]. Veterinary breakpoints were used for ceftiofur (cattle), cephalotin (dogs) and enrofloxacin (dogs). Because veterinary breakpoints for several antimicrobials have not been described, human breakpoints were used for penicillin, ampicillin, tetracycline, clindamycin, erythromycin, trimethoprim sulfamethoxazole, rifampicin, amoxicillin/clavulanic acid, cefoxitin, chloramphenicol, gentamicin, kanamycin and neomycin. For fusidic acid, EUCAST-criteria were used (www.eucast.org), because no breakpoints were available in the CLSI standards. In total, twenty different spa types were found, the majority of isolates belonging to t042 (58%) and the closely related t15786 (11%) and the distribution of spa types was similar across the two regions (Fig. 1). The proportion of lukM-lukF’ positive S. aureus in our sample was low (3/79; 4%). Seven isolates carried pvl (7/79; 9%) and tst was detected in eight isolates (8/79, 10%). All t14061 isolates (3/79, 4%) were positive for tst; pvl was present in all t355 (3/79, 4%) and t1376 (2/79, 3%) isolates. None of the isolates carried the mecA gene. Table 2 summarizes the spa typing results and presents the isolates positive for virulence genes. All six t042 isolates subjected to MLST typing belonged to a new ST, ST4550 which is a double locus variant of ST97. The other isolates subjected to MLST were ST1 (t273), ST22 (t17184), ST88 (t488) and ST848 (t409). All the data in this paper are available in Additional file 1. All 79 isolates were susceptible for cefoxitin and were therefore classified as methicillin-susceptible S. aureus. Resistance to penicillin/ampicillin (86%) and tetracycline (54%) was high, while the resistance to other antimicrobials was limited. The MIC values and numbers of isolates resistant to the antimicrobials included in the testing are presented in Table 3. Associations between spa-type and AMR patterns were not found. Percentages resistance to antimicrobials by spa-type for 79 S. aureus isolates is presented in Additional file 2. The aim of this study was to characterize S. aureus isolates cultured from milk samples of dairy farms in North-Western Ethiopia based on spa typing, virulence genes identification and AMR. The spa types t042 and the related t15786 were dominant, together representing 69% of the isolates. Such a high degree of relatedness suggests contagious transmission [13, 14]. Since our isolates were derived from different farms, contagious transmission is likely to occur not only within, but also between farms, possibly through cattle movements between farms, or from the government breeding and heifer distribution centers. Four of the spa types (t042, t223, t306 and t355) identified in the current study were previously isolated by Tarekgne et al. in cattle in the Tigray region, Northern Ethiopia. Interestingly, in that study the dominant spa type was t314, which has a repeat sequence entirely different from the dominant types in our study. This suggests that, although contagious transmission seems to occur at a local scale, exchange of strains between regions seems to occur less, resulting in dominance of different clones in different regions. The Tigray region has a different cross-breeding and heifer distribution center, possibly explaining different dominant clones between regions. 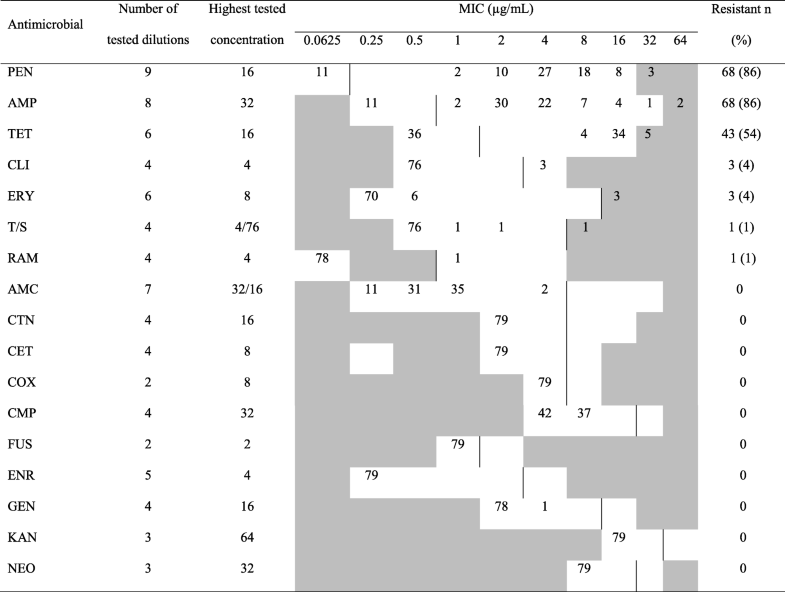 The six t042 isolates subjected to MLST belonged to the new ST4550, which is a double locus variant of ST97, a ST commonly found in bovine mastitis worldwide [30–32]. The proportion of isolates positive for lukM-lukF’ genes was low. As the majority of isolates in our study belonged to a ST related to ST97, this low lukM-lukF’ prevalence is in line with previous reports that found ST97 isolates to be negative for lukM-lukF’ [16, 17]. The isolates that were positive for lukM-lukF’ belonged to t14061 and t10018, the latter of which has previously been found in nasal swabs from Nigerian abattoir workers . The bi-component leukocidin LukM-LukF’ is predominantly produced by strains isolated from bovine S. aureus mastitis  and specifically kills bovine neutrophils, whereas human neutrophils are not affected . Based on an experimental study, Vrieling et al. reported that LukM-LukF’ is produced during the course of infection and that a high levels in milk were associated with increased severity of mastitis. The low proportion of lukM-lukF’ positive isolates in our samples may be partly due to the fact that they came from a cross-sectional study that included only two cases of clinical mastitis . In our collection the proportion of isolates positive for pvl was higher than that of lukM-lukF’, despite the fact that bovine neutrophils are insensitive to this human-associated leukocidin . Although there are reports of pvl-positive cattle S. aureus [16, 35], pvl is mainly detected in S. aureus of human origin [19, 36, 37] whereas cattle isolates are often negative for pvl [38–40]. The finding of pvl in isolates cultured from cows may suggest human to cow transmission of S. aureus. Schmidt et al. reported transmission of a human ST8 isolate to a dairy cow which subsequently caused mastitis and speculated that the close contact between dairy cows and humans, especially in the milking parlor, enables such transmission. Under the Ethiopian circumstances, where cows are hand milked, such transmission seems to be even more likely. Further characterization of the pvl-positive S. aureus in this study and of S. aureus isolates cultured from farmers and their families may help quantifying the importance of human to cattle transmission of S. aureus. Likewise, similar studies on bovine isolates that may be found in humans may also show sharing of S. aureus isolates between cattle and their farmers, which likely occurs along the same transmission routes. The tst gene encodes the toxic shock syndrome toxin, which S. aureus uses to facilitate colonization . Although the tst gene is documented to be more prevalent in bovine than in human S. aureus strains , we only found it in a low number of isolates. In line with the report of Tigabu et al. from the Central highlands of Ethiopia, we did not find mecA positive S. aureus in our sample. The majority of our isolates were, however, resistant to penicillin, ampicillin and tetracycline. Resistance to penicillin and ampicillin is common among mastitis causing S. aureus, but varies largely between geographical regions [45–47]. In Ethiopia, penicillin and ampicillin are commonly used antimicrobials to treat mastitis, and tetracycline is often used to treat other bacterial infections. The high level of resistance to these antimicrobials is in line with previous Ethiopian reports on isolates from bovine mastitis [6, 7, 48]. This consistent picture of widespread AMR in S. aureus is alarming and likely results from the high usage of antimicrobials, possibly due to the fact that farmers can obtain antimicrobials over the counter without a prescription. Additionally, farmers are often not instructed on a proper treatment regimen, because guidance by veterinarians is lacking. A final reason for the high level of AMR may be that Ethiopian farmers are not inclined to cull animals, but rather continue treating their cows over and over again for an extended period of time. Treatment of cows with mastitis during lactation is an important component of a standard mastitis control program for contagious pathogens. Because AMR to penicillin and ampicillin is common, amoxicillin-clavulanic acid may be used for treatment of IMI without the need for tetracyclines, macrolides, lincosamides or third-generation cephalosporins. However, antimicrobial treatment is less than desirably effective in eliminating existing S. aureus infections  and treatment of intramammary infections with penicillin-resistant S. aureus strains generally results in a lower cure rate for treatment with either β-lactam or non-β-lactam antibiotics . If cows do not respond favorably to treatment, separation or culling of the infected animals can be used to limit further transmission, but in Ethiopia, dairy cows are not easily culled because cross breed cows are very valuable for reproduction, even if they are chronically infected and have repeated CM cases. Therefore, encouraging dairy farmers to prevent transmission of S. aureus, rather than to rely on antimicrobial therapy is a preferable approach for mastitis control in North-Western Ethiopia. For instance, milking hygiene can be improved  and post milking teat disinfection  is not very expensive, is easy to perform, and is known to be very effective and can be practiced by Ethiopian dairy farmers. Implementation of these and other control measures will likely result in a lower prevalence of mastitis. We showed a high degree of similarity between the bovine S. aureus isolates in North-Western Ethiopia, suggesting contagious transmission within and between farms. Moreover, there was a high level of resistance to antimicrobials that are commonly used to treat mastitis in Ethiopia. Therefore, implementing effective preventive measures aiming to limit transmission, rather than to use antimicrobials to control mastitis, along with guidelines for prudent use of antimicrobials, is important to decrease AMR. We acknowledge the dairy farmers who participated in the study. We are thankful to the support of Merijn van den Hout (University of Applied Sciences, Den Bosch) and Lindert Benedictus (Division of Infection and Immunity, The Roslin Institute, The University of Edinburgh, Scotland, UK), for assistance in the lab work. Ato Teklu and Sisay, from Gondar artificial insemination service, are acknowledged for helping selecting participants. This study was supported by the Netherlands organization for international cooperation in higher education (Nuffic) and the Gustav Rosenberger Memorial Fund. SAM, TST, GK and TJGML conceived and designed the study. SAM, JH, EMB, AER and MPS performed laboratory work. GK, TJGML, EMB, JH, VPMGR and SAM interpreted the results. SAM and GK: wrote the manuscript. All authors reviewed, edited and approved the manuscript.